Update 2/26/16: Awesome big update today from Inbox regarding new snooze options. As a result of tons of user feedback, snooze has been redesigned and adds some time-saving additions. Adding to the existing options, users can now snooze to Later this week as well as this weekend. In addition, users will now also be able to set what their weekend days are and what helps you the most with your snooze options. 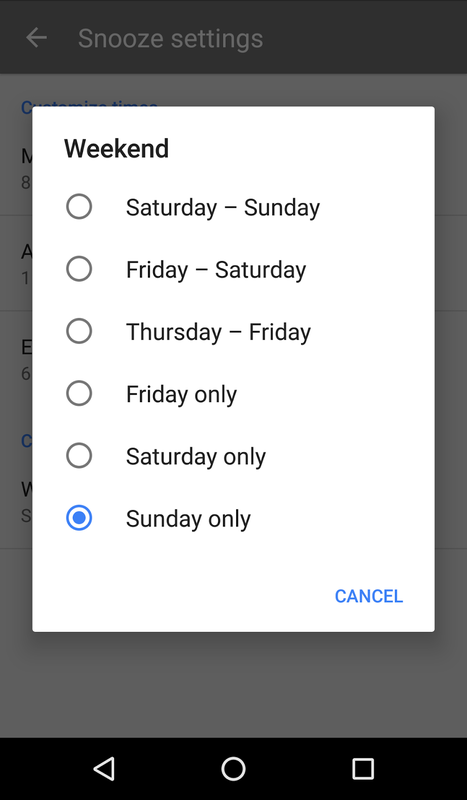 Hope you are enjoying all of the recent updates to Inbox snooze options as they roll out over the next few weeks. Update 2/17/16: Do you travel a lot? Don't you hate the fact that your snoozed items appear at the time you set when you were in a different time zone? Well, it seems the Inbox team added a lovely feature to the mobile app where you can choose if your snooze times update to reflect the time zone you are in. Just navigate to the settings, choose your account, and tap on the Travelling to a New Timezone setting, and adjust accordingly. Although I don't travel much, I find this setting to be a welcomed addition. Update 7/16/15: Snoozing your emails have now gotten a little bit smarter. 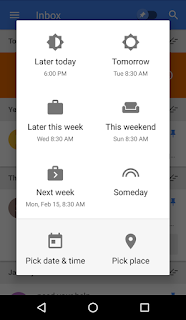 Starting today Inbox will begin suggesting "Snooze until" for various types of emails, including flights, package tracking, reservations for events or restaurants, calendar invites, as well as hotel and car rental reservations. 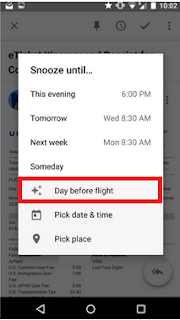 So as an example, when snoozing a flight confirmation, you may see a "Snooze until Day before flight" as a suggestion. I think this is a really helpful addition to Inbox that really will speed up your email processing, and help you get to Inbox Zero even quicker. Apparently one of the more frequently reported requests was for custom snooze times for your default day parts - Morning, Afternoon, and Evening. I know I was one of those requesters. It seems, once again the teams at Google are listening, and Inbox by Gmail began rolling this feature out. As of the time of this writing, approximately 5% of customers have been given this feature. Simply put, when you snooze an email, select the date and under time, choose Custom. The system will recognize that you are picking a morning, afternoon, or evening and a popup will be provided offering you the option to make this your default setting. Currently defaults are 9:00 AM (Morning), 1:00 PM (Afternoon), and 5:00 PM (Evening). 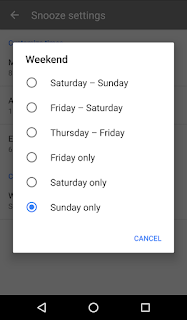 If you choose a custom time, and select to make this your default setting, every time you choose Morning, Afternoon, or Evening, your custom time will be display and selected. This selection will also carry forward to the other snooze options. This Evening will now use your selected Evening time, while Tomorrow and Next Week will use your Morning time. In addition to giving you the option while setting a custom snooze time, you can go straight into the Settings and you can change the times at your leisure. These are all welcome features, but it would be great to have this time customization extended to when Bundles are set to appear as well.